Special built to order kit, drop ships international air mail. Exchange rates may affect pricing. Please inquire with your exact shipping address for freight quote. This world exclusive Bullet designed kit is perfect for the Landcruiser owner who tows or uses their vehicle for off road workouts. The Positive displacement Supercharger system has been developed with reliability being the main focus. Small boost levels of only 5 psi allow the engine to comfortably perform without stressing internal components, whilst delivering exceptional power and torque increases. The Supercharger delivers maximum boost from “off idle” all the way to the engine redline. This means that instantaneous Torque is available down low where you need it – when taking off from a standing start with a heavy load or caravan on the back or when in low range on a sandy beach or in boggy mud. Fuel Economy remains the same (if not slightly better) on average due to the increased torque available from the engine, with returns of under 18 litres per 100kms easily achievable when towing. More power is developed down lower in the engine rev range meaning the engine does not have to rev as hard to produce the same level of power. This is most noticeable when towing up a hill – the gearbox does not have to downshift as often as more torque is available through the mid range. No engine internal modifications needed to realise Power and torque increases of up to 50%. Fitment of Supercharger in the engine “V” retains factory look whilst fitting under the standard bonnet line. 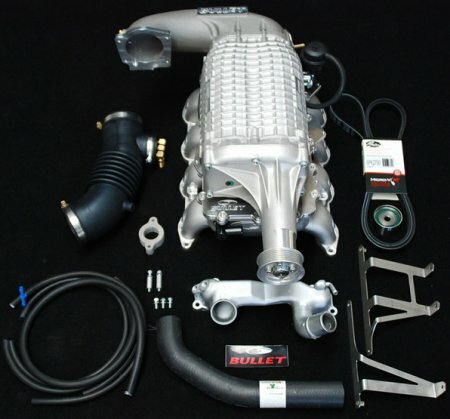 *This supercharger takes 2-3 weeks delivery from date of purchase. Please inquire for more data.